Bed bugs: frustrating, annoying pests at best...hungry, nocturnal bloodsuckers at worst. When faced with a bed bug infestation, you're probably finding yourself deprived of a decent night's sleep. Even worse, you feel helpless in dealing with the problem yourself considering their size makes them almost impossible to detect. Should You Call A Bed Bug Exterminator? When Should You Call for Expert Help? The only real option you have in this situation is to call a bed bug control service. 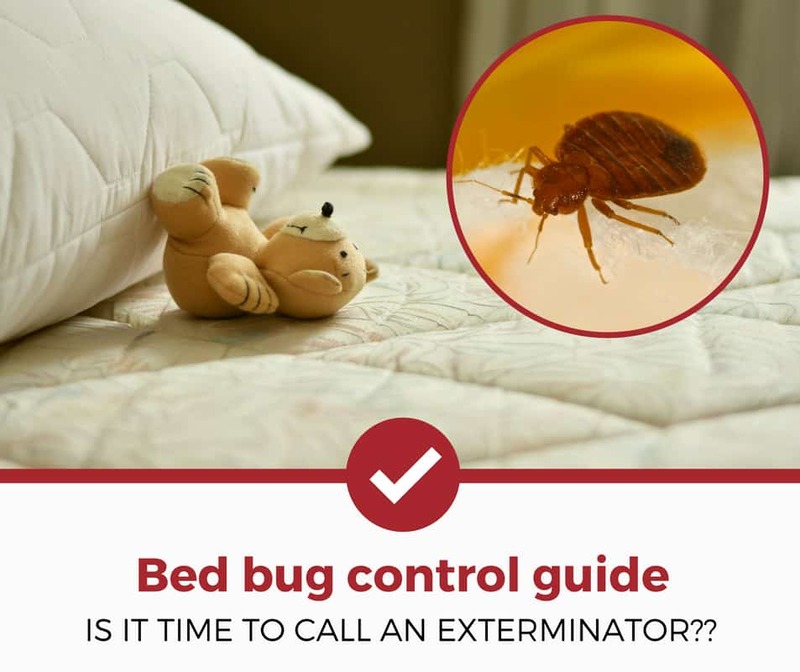 While a bed bug exterminator is indeed just a quick phone call away, this critical first step is (sometimes) a lot more complicated than you might think. Bed bugs are indeed quite small and you may want to solve the problem on your own. But can you really get rid of the problem that keeps on biting you in your sleep? Or is it better to call in a pro for bed bug control service? If this is your first time to consider calling for bed bug control service, chances are that there are still a lot of things that you don't know about these small (but terrible!) pests. The size and appearance of bed bugs make these pests nearly invisible to the naked eye. They're about the same size of a pin head with a brown appearance. Bed bugs have flat bodies that can easily squeeze into the smallest or most restricted hiding spots. They feed on human blood but can also live for more than a year without food. Although these pests often dwell in bed mattresses, bed bugs can live almost anywhere. To top it off, they are impeccably clever when it comes to finding the best hiding spots during the daytime. Lastly, a single female bed bug can lay 300-500 eggs throughout her lifetime. These are just a handful of the laundry list of reasons why bed bug infestations are better off in the hands of professional pest exterminators. When you find a warning sign, it's best not to let these bloodsuckers fester between your sheets any longer than necessary! ​Are you still trying to find ways to get rid of these nasty bugs by yourself? Well, whether you like it or not, bed bugs are very hard to get rid of. Apart from their nearly undetectable size, their population can balloon to an overwhelming size in a matter of mere days. Even worse, they can easily spread throughout your home without you noticing them whatsoever. Basically, your infestation shouldn't have to get really bad before you decide on calling for a bed bug exterminator. Bed bugs are extremely good at hiding—especially during daytime. In most cases, homeowners who do the inspection on their own are actually faced with a far greater problem than what they expected. Although bed bugs are not known to be carriers of diseases (unlike cockroaches and mice), an infestation CAN severely affect your day-to-day life. And this triggers a lot of homeowners to try to deal with the problem immediately on their own. But is it really a good idea to do so? ​The answer is NO! Why? Most DIY solutions are not actually effective in totally eradicating the entire population of bed bugs inside the concerned property. Even worse, some of these DIY treatments—bug bombs, for example—pose a serious threat to you and your family's health. And since bed bugs literally live and hide on your personal belongings such as your clothes, blanket, and mattress, spraying solutions directly without proper knowledge can also lead to your things getting damaged at the same time. Now that you've made your decision about effectively dealing with a bed bug infestation, the next important thing to deal with is the actual cost of hiring an exterminator. How much is today's bed bug control cost from inspection to treatment? ​​For those who prefer dealing with bed bugs in one blow, pest control companies offer a one-time type of treatment application. The program starts with a thorough inspection and is followed by treatment application within the same day. This type of control is applicable for all types of infestation (slight to severe) and often preferable to homeowners with a busy schedule. One-time bed bug control ranges from $300 to $1,500 depending on the size of property and severity of infestation. ​Larger properties with severe cases of bed bug infestation spread throughout the house often requires multiple visits from the pest control company. This is made possible through a contract, which is spearheaded by property inspection to identify contaminated areas while searching for possible entry points. The inspection phase can cost you somewhere between $150-$200, depending on the complexity of your home's internal structure and its total area. The contract should indicate the frequency of the visit as agreed by both parties. ​​Monthly - The figure sits around $40-$50 per visit. Bed bug infestation has reemerged worldwide. These pests can easily enter your property in various ways, and there's no telling when a single insect can trigger a recurrence of the infestation. These pests can spread quickly, which prompts many homeowners to acquire regular maintenance from their trusted bed bug control specialist. ​Calling an exterminator is the very first step in overcoming your bug problem. The overall success of bed bug control treatment also depends on how well you can communicate with them. You should know exactly which details to tell your exterminator, especially if this is your first time to make such a call. Pest control companies know that bed bugs take refuge in your bedroom—particularly mattress and blanket most of the time. But as mentioned earlier, bed bugs can live anywhere—from behind baseboards and wallpapers to furniture crevices—and all types of upholstery found in your home. Conducting a thorough sweep of your property on your own prior to the exterminator's actual inspection can help save valuable time and secure a good head start for the treatment on the big day. ​It is very critical to be very specific especially on the time you first observed the signs of the infestation. The pest control company will then most likely ask you if you have accommodated guests recently or if you have traveled out of town and stayed in a hotel or someone else's house. Such details will help the exterminator conclude as to how your property got infiltrated by bed bugs. The temperature of your room also plays a critical role in the progress of bed bug infestation. Bed bug population thrives at normal room temperature, particularly at 72 degrees Fahrenheit. It would also help to take note of the usual temperatures in other rooms of the house. This will help the exterminator determine other possible hiding spots for bed bugs throughout your property. ​Although small in size, bed bugs also give off quite a scent. Bed bugs are known to release pheromones that have a musty scent. If your bedroom smells like a dirty locker room, it could be that you're actually smelling bed bugs, and not your dirty laundry! Worse cases of infestation give off a much stronger scent. ​Bed bugs consume human blood to survive. If your bedroom has bed bug infestation, it simply means that YOU ARE THEIR FOOD! Waking up to a number of red and itchy bumps is one of the very first signs of bed bug infestation. Bed bug bite marks are usually found on the arms and legs and sometimes on the neck, face, and shoulders. These bite marks appear in tight lines or in clusters. They are either flat or raised red welts with a dark spot at the center. Long story short: there are a lot of bug exterminators out there willing to deal with your infestation problem. However, it's crucial to realize that not all of them are truly capable of delivering the results you need. Here are some important things that you need to consider before making that critical decision on which pest control company to trust. Checking the credentials of the prospective company is the very first step in making sure that your chosen exterminator works with strict adherence to state laws. Ask if the company is a duly registered exterminator with licensed and certified pesticide applicators and technicians. You can call the pest control regulatory agencies to check on the authenticity of the exterminator's credentials, as well as if there are any recorded complaints or malpractices. Ask for a list of the bed bug exterminator's previous clients. Try calling at least two or three from the said list and ask for their opinion regarding the concerned company's overall performance. A confident pest control company will have no problems or hangups providing such a list to a prospective client. In doing so, they're furthering their own business and highlighting satisfactory jobs which have been previously completed. A company's experience isn't measured only in the number of years it has been operational in the industry of pest control services, but also effectively gauged by the number of clients served. The bigger the roster of satisfied clients, the better. A preferred option would be an exterminator with deep experience in dealing with all levels of bed bug infestation within different sizes and types of property structure. For a few more excellent tips on finding a specialist for your bed bug problem, take a look at what research entomologist Jeff White has to say about interviewing possible pest control companies in the video below. Basically, there are two known types of treatment available for bed bug control: heat and insecticide. These two approaches have different benefits and setbacks, so it is important to determine which is right for your property. The first type of treatment involves heating infested areas for at least six hours. Through the use of a special heating equipment, the temperature of the affected room can reach up to 60 degrees Celsius. The technician monitors the entire treatment process through the aid of remote thermometers strategically placed in various key areas of the room. This is to make sure that adult bed bugs and their eggs become exposed to lethal heat, no matter where they hide in the room. This treatment doesn't involve the use of harmful chemicals, but also doesn't offer protection from recurrence of infestation. The insecticide type of treatment is applied in two different forms—the contact and the residual insecticide. The contact insecticide is a fast-acting formula that can instantly kill bed bugs upon direct contact. The residual insecticide, on the other hand, acts continuously even long after its application. This particular form of insecticide is usually applied on cracks and crevices, where it can seep in and work for weeks or months afterward. With insecticide treatment, the treated area is protected from getting reinfected at least for a certain period of time. It can, however, pose a significant threat to you and your family's health. Before any treatment is initiated, it's important to let the exterminator know if you have pets in the house. This way, the technician or pesticide applicator will be able to give you helpful advice on what to do with your pets during treatment. Basically, how you secure your pets depends mostly on the severity of the infestation. For mild infestation, the exterminator will only have to treat the infected room(s) of the house. In this scenario, you'll be able to keep your pets in another room or area of the house not scheduled for treatment. For severe cases of bed bug infestation, the exterminator will most likely recommend the entire house for treatment. In this case, you will have to take your pets outside your home or better yet, secure them in their kennel. Depending on the size of the treated area, you will have to secure your pets for at least 6 hours or so. You must work hand in hand with your exterminator in order to completely eradicate the bed bugs' existence inside your house. After the exterminator has done his part of the task, it's time to do yours. The problem, however, is that a lot of homeowners don't know what to do after bed bug treatment. The secret lies in understanding the type of treatment that you acquired for your property. First and foremost, you will have to check and inspect the rooms or areas of your house not affected by the treatment. Check the undersides of the furniture as well as on the cracks and crevices of the wall to make sure that no surviving bed bugs are able to escape undetected. Next, furniture pieces from the treated room(s) should be taken outside and placed directly under the sun at least for one to two hours. Prolonged and direct exposure from the sun's heat will deliver a killing blow to any surviving bug. For insecticide treatment, you will have to stay away from the infested room(s) for at least 6 hours from the time the exterminator has finished and left your property. On the other hand, you can almost instantly access the concerned room in heating treatment right after the exterminator has finished up. Following a heat treatment, you can do the after treatment clean-up and dispose of the dead bed bugs and eggs properly instantly. Bed bugs can neither fly nor jump, but they can easily travel from place to place fast. A single bed bug can start a whole new infestation by conveniently hitchhiking on a person's clothing, pet, or luggage. As soon as you find out that you have bed bug infestation in your home, it is best to tell your neighbors about the problem right away...since there is a good chance that they're also having the same infestation, unbeknownst to them. This helps lessen the chances of the infestation recurring in your home, since your neighbors will most like be taking the same control step. Calling in a pest control specialist to handle your bed bug problem may seem like a last resort, but really, it should be your first instinct. Bed bugs aren't just gross, they're actual parasites. These little vampires in your bed feed off your blood while you're asleep and breed by the thousands...of course you're going to need professional help to kick them out! When choosing a qualified pest control specialist, make sure to pick one with the right experience, credentials, and know-how to get the job done right. In our guide, we've given you the tips you need to find your bed bug professional so that you can rest easily tonight. Don't let the bed bugs bite!